Water damage can be a tricky situation, finding the source and the extent of damage. 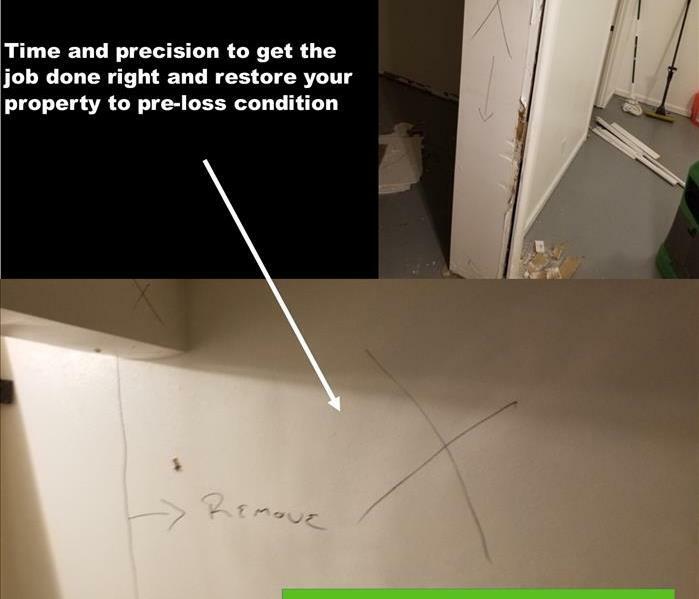 When the damage is in the walls precision is key. Our technicians are trained and equipped with the tools necessary to locate the source of loss as well as the extent of damage. You only want us to cut once and measure twice, right? That is exactly what SERVPRO® of Salem West's technicians do. Marking the path of damage is key in order to remove as little materials from your property as necessary. Our technicians have no problems getting down and dirty, no matter the type of job. Precision is key and the only way to achieve that is by getting up close and personal with the loss source. Water losses in a kitchen can be especially difficult to dry and often times have hidden damage. The water damage spread behind the cabinets. 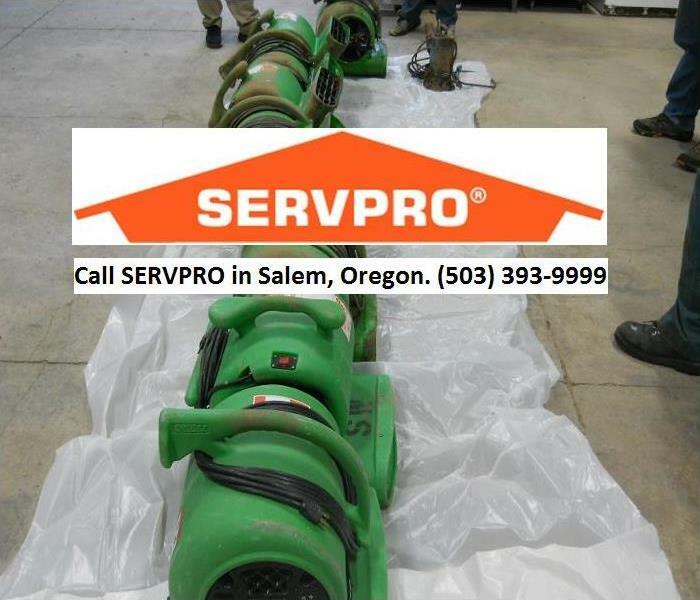 SERVPRO of Salem West is 24/7 to help fix fire, water or mold damage before it gets worse. Let SERVPRO do it right the first time. Call (503) 393-9999 for an inspection and estimate. The count is in! 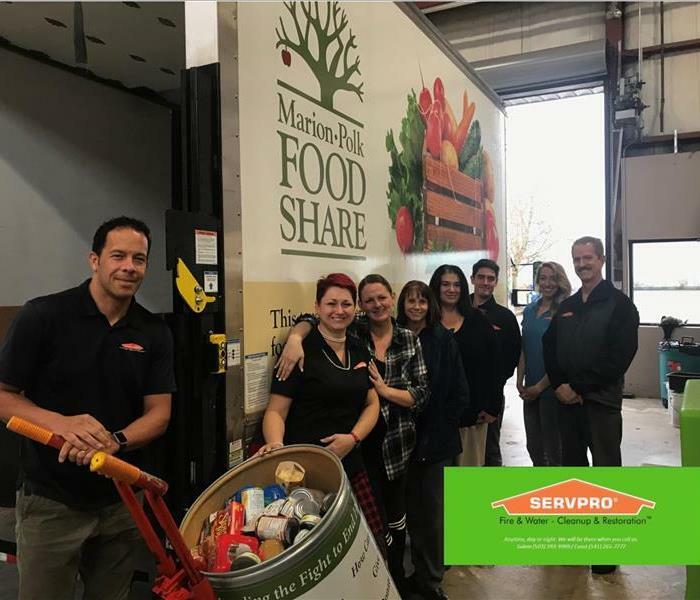 SERVPRO of Salem West has been able to provide 1,074 meals for the Marion-Polk Food Share. 1,074 meals to help those in our local community stay fed in times of need. Our partnership with the Food Share began in November 2018 and we will continue to grow a strong bond by volunteering and participating in food drives throughout the years. Donations can be made to the Marion-Polk Food Share anytime of the year. To find out more information, click the link above. SERVPRO of Salem West has a strong community focus that grows with each year. 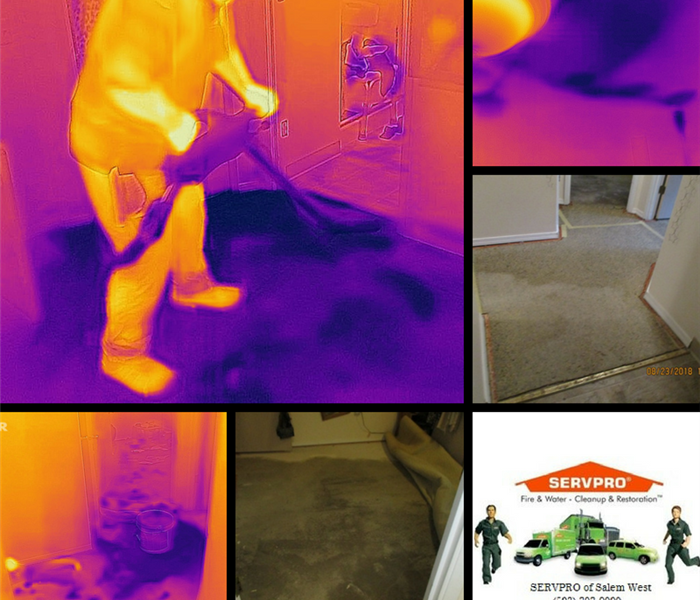 SERVPRO® of Salem West is your trusted and local restoration company, here to serve you. Unfortunate events happen when you least expect them. Our motto is to restore your property to "Like it never even happened." From water mitigation to fire clean-up our technicians are on call 24/7/365, including holidays. Remember SERVPRO® of Salem West if you are faced with a disaster or loss. (503) 393-9999. At the close of each month we hold an all staff meeting where we discuss safety topics, welcome new employees, celebrate birthdays and anniversaries as well as recognizing individuals for outstanding work. For the month of November, we recognized Jessica Curtis, Jessica Regaldo, Davinia Booner and Amanda McGee for their outstanding workmanship and customer service. Each of the ladies was honored with a certificate and a gift card. Everyone here at SERVPRO® of Salem West puts forth 100% in each job and has their own unique qualities. We are grateful for our staff and feel that showing appreciation to them builds a strong moral and brings about an enjoyable work atmosphere. 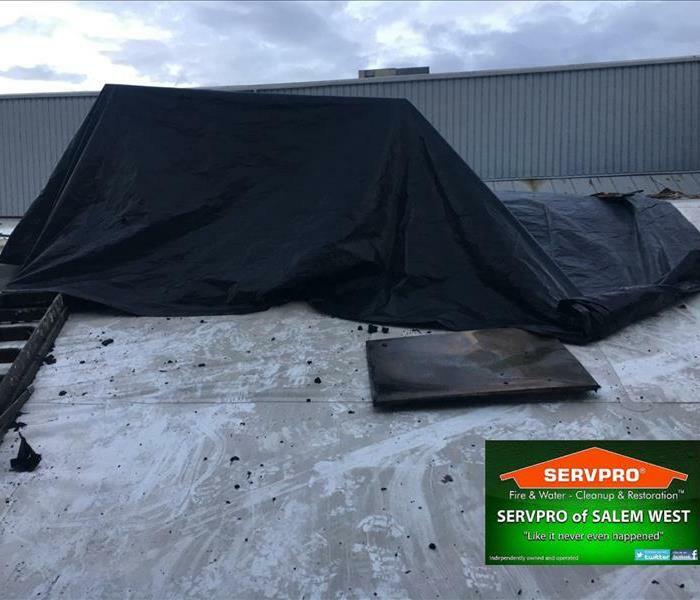 After a fire or roof leak call SERVPRO of Salem West to being the restoration work. Especially during the stormy season in Salem, Or. 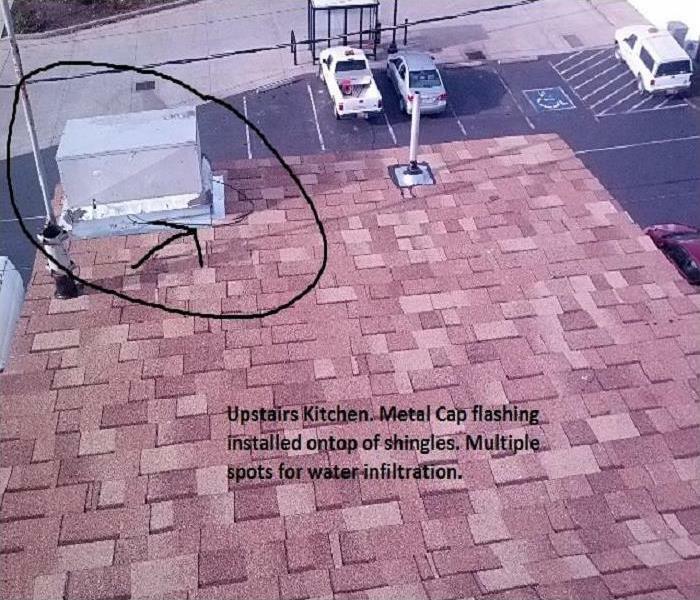 A local community landmark suffered a fire in their HVAC unit causing roof leaks. Our team responded and was able to provide a temporary fix by placing a tarp/covering on the roof. 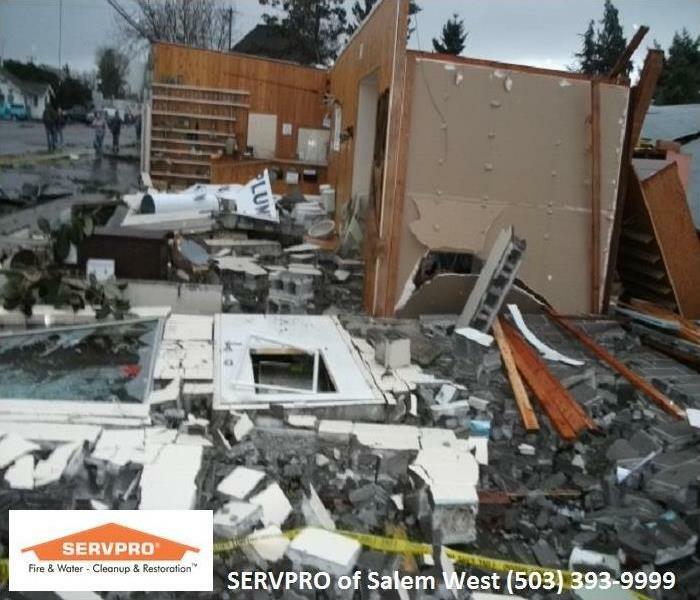 If you find your property in an unfortunate event, remember to call SERVPRO of Salem West and we will take care of you. Our Salem Policemen and Women showed up in full force welcoming each visitor at the entrance. Coffee, cake, and comradery followed. It was a joyous and proud ceremony, and long overdue and well deserved. Many people have fought for this project, some I recognized and smiled to in the crowd. 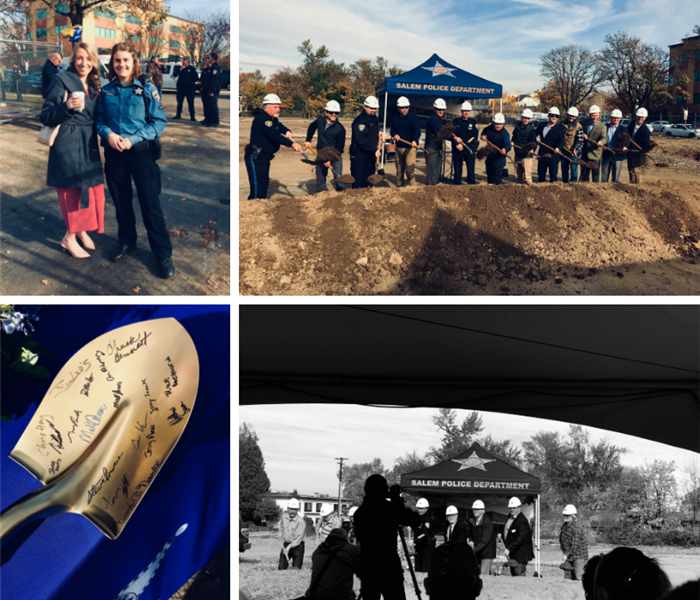 With each turning of ground from each shovel, I felt pride for the community. Pride for our police department. Most of all, I felt proud to be there. Halloween is a time for excitement and mischief, but you need to remember everyone's safety. We have come up with our top 10 Safety Tips for Halloween. At the end of the day we all want CANDY, right? Let's all take a few moments before the kiddos jump into the sweet and make sure it's all safe. 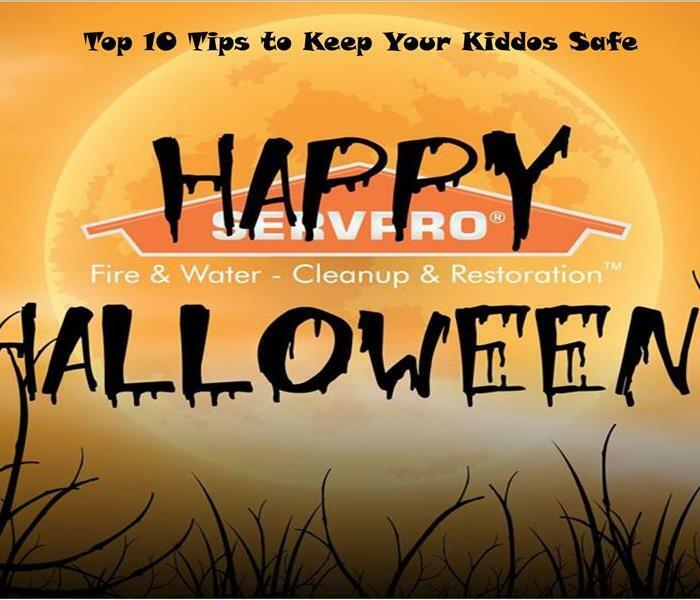 From our SERVPRO families, have a spooktacular night of trick or treating. May there be more treats than tricks. Rest assured, we have your back! The weather is turning cold and animals are looking for warm places to live. Let us help you remove the odors.....it's almost holiday time. 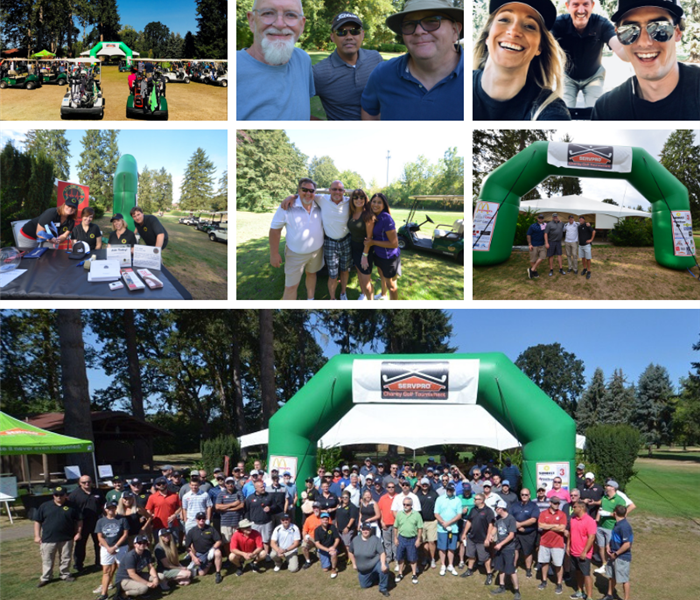 Our 10th Annual Charity Golf Event was a blast! The sun was high, squirrels and deer were on the course and of course laughter from every corner. SERVPRO of Salem West along with our sponsors & players raised over $17,000 for the Salem Fire Foundation! Look for us next year at the 11th Annual Charity Golf Event. In the case of an emergency disaster, call the professionals at SERVPRO of Salem West. Emergencies happen unexpectedly and we dispatch a team quickly. In Salem, Oregon two apartments suffered water damage from the upstairs toilet overflowing. Our techs began extracting water and the images show the amount of moisture and water in the structure. If you find yourself faced with a disaster remember your local SERVPRO of Salem West is here to help. Call us (503) 393-9999 24/7/365. 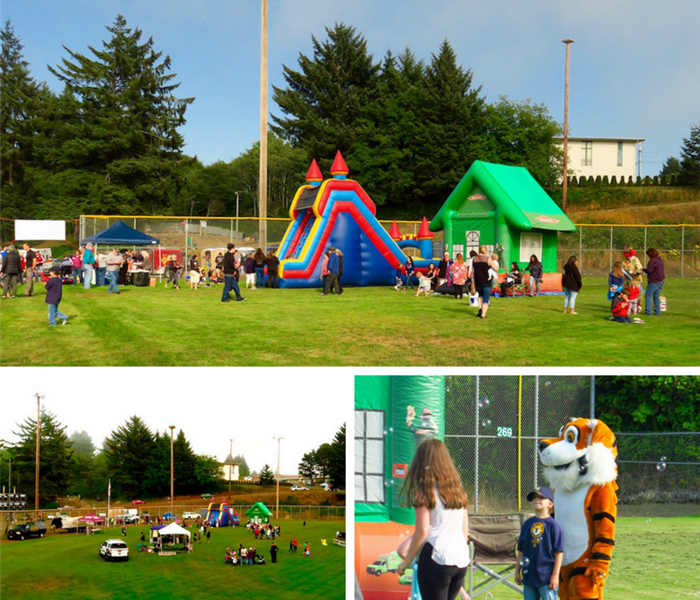 SERVPRO of Lincoln & Polk Counties was pleased to support Lincoln City's 1st Annual National Night Out. Photos courtesy of Jack Seagrove. 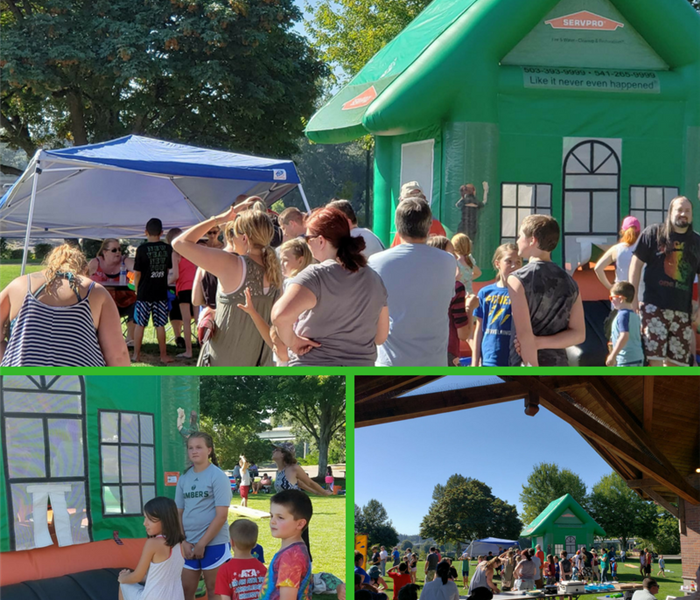 In July, SERVPRO of Salem West supported West Salem ATA Martial Arts School by providing our bounce house for their annual picnic at Riverfront Park in downtown Salem, Oregon. Children of all ages, yes including a few instructors took part in bouncing. Our team here at SERVPRO of Salem West is involved with our local community and enjoy bringing smiles to everyone's face. 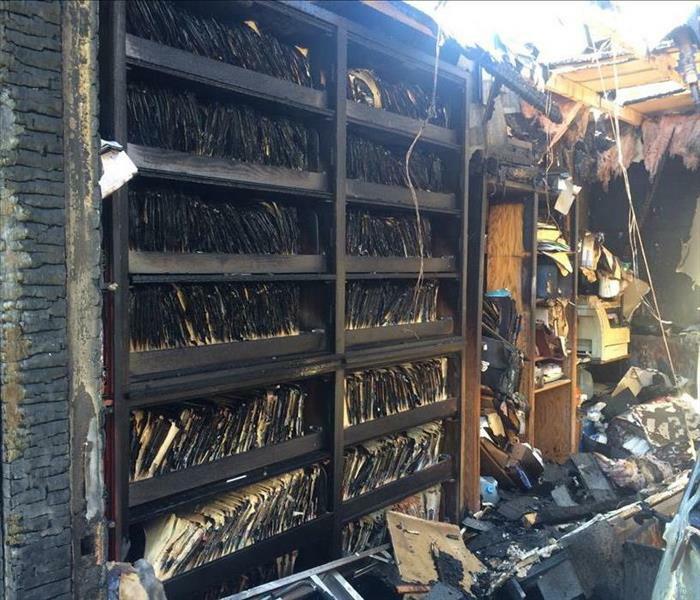 A fire occurred in Dallas, Oregon causing fire and water damage to many documents. SERVPRO of Salem West quickly arrived on scene and began collecting the contents. if you find yourself with damage to documents, artwork or family heirlooms, call SERVPRO of Salem West (503) 393-9999. 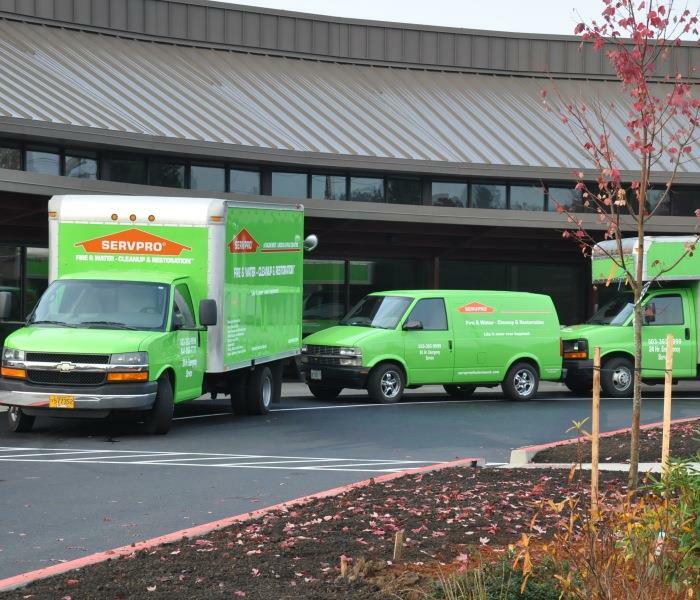 With our vehicles standing by and our crew ready to roll, SERVPRO of Salem West is faster to any size disaster. Each vehicle is equipped to handle any job, day or night. 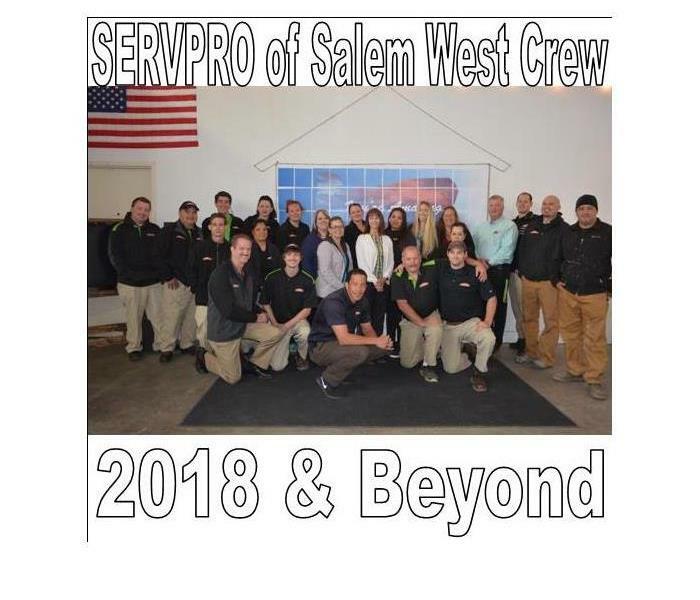 We here at SERVPRO of Salem West have an outstanding crew who are compassionate about each job we receive, customers and their fellow co-workers. Cleaning Equipment in Salem, Oregon. 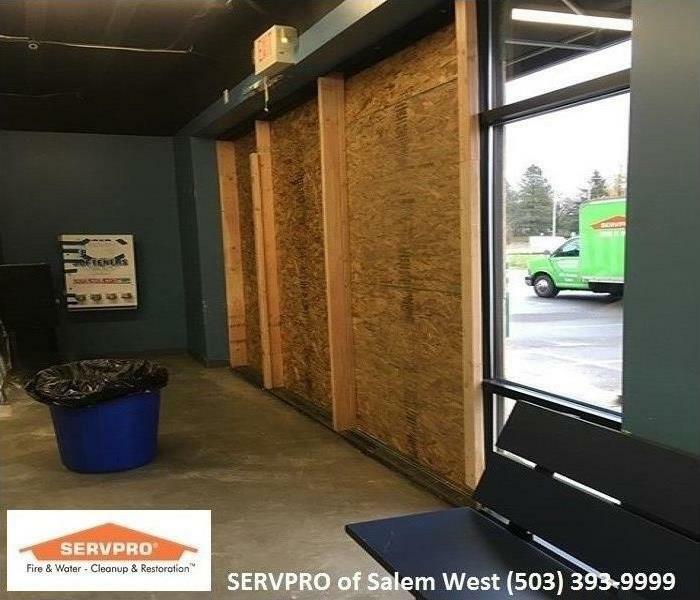 SERVPRO of Salem West has all the equipment, training and certifications to take care of that unwanted water, fire, mold, bio, broken window, or vandalism problem. SERVPRO knows just how to take the stress and worry out of issues like this so you can focus on other things. Call us any time at all. (503) 393-9999. This is the aftermath of a storm that hit Aumsville, Oregon in 2010. We will be the first ones to help at any time, day or night. SERVPRO of Salem West is open 24/7/365 because we know disasters don't wait for normal business hours! Tags: Salem, Oregon Keizer, Oregon water damage, fire damage, bio cleanup, mold remediation, commercial services, storm damage. A laundry mat in Salem, Oregon experienced broken windows. 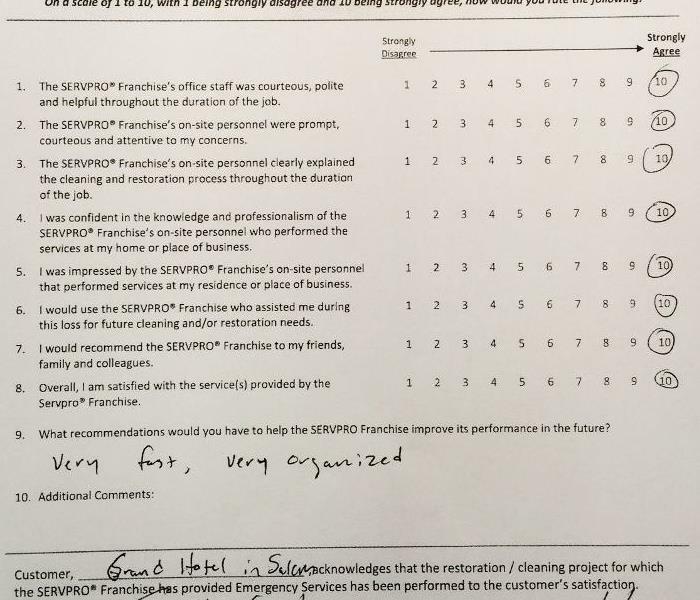 They called SERVPRO to board everything up, quickly and efficiently. If you experience a broken window in your home or business call SERVPRO of Salem West at (503) 393-9999 to get it boarded up. 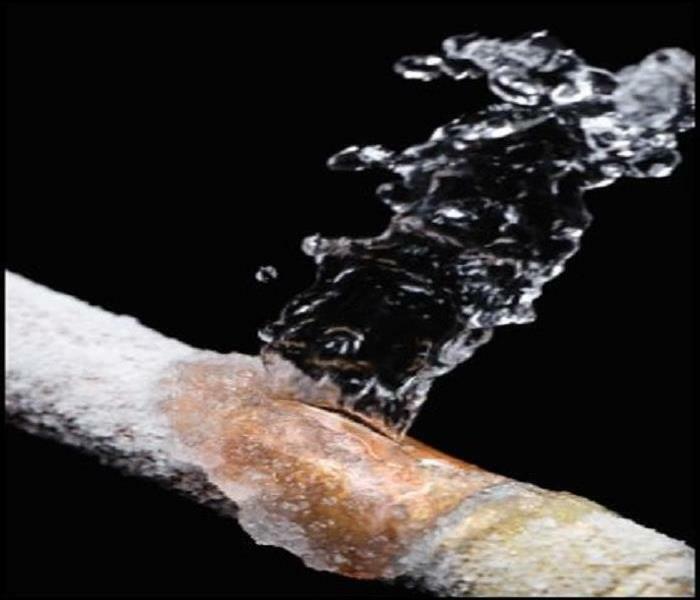 Not only can melting ice and snow cause water damage, snow and ice storms can also cause pipes to burst. SERVPRO has everything you need to fix water damage of any kind. 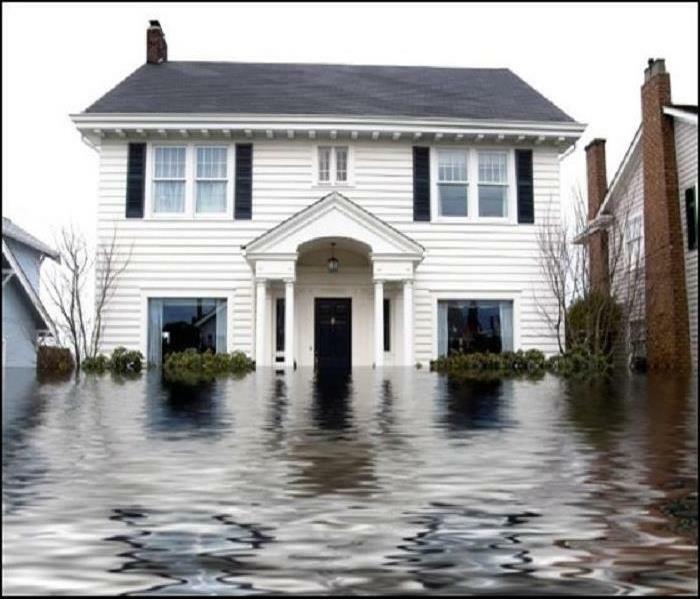 SERVPRO of Salem West can take a look at potential water damage. Give us a call at (503) 393-9999. 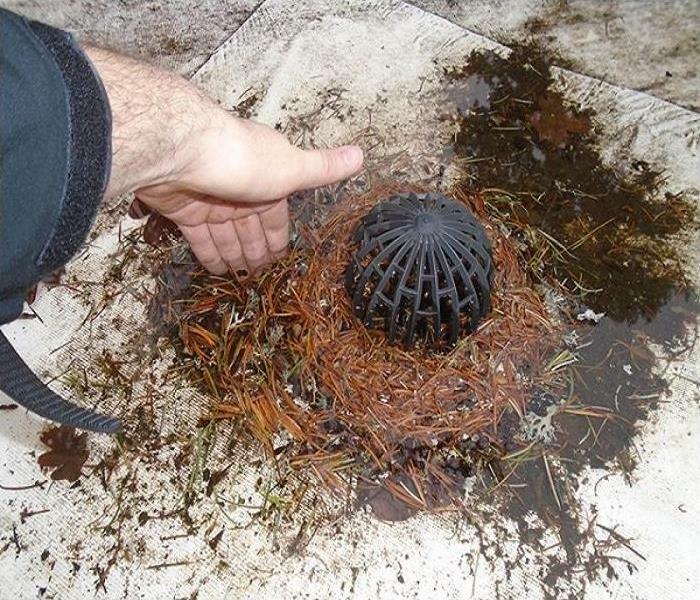 "A Clogged Drain Only Builds"
Making sure to service those rain gutters regularly during the windy and rainy times in Oregon could save you from clogged drains and prevent water damage. 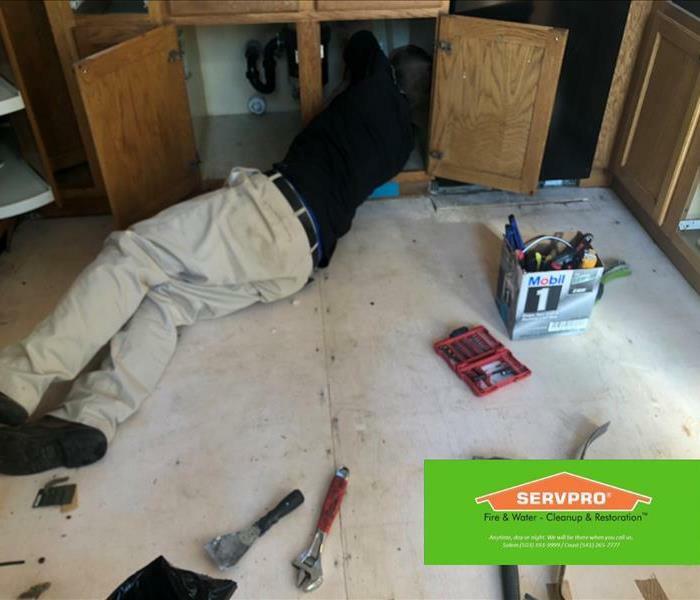 If you get stuck in this situation, don't hesitate to call SERVPRO of Salem West for an estimate today at (503) 393-9999. Flat roofs require additional maintenance to prevent standing water which causes problems over time. 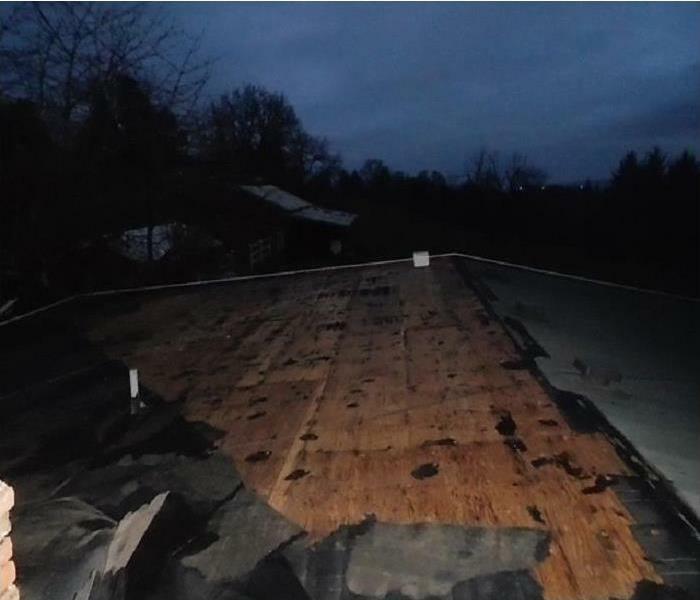 This is a home in Salem, Oregon that collected several inches of water on the roof. 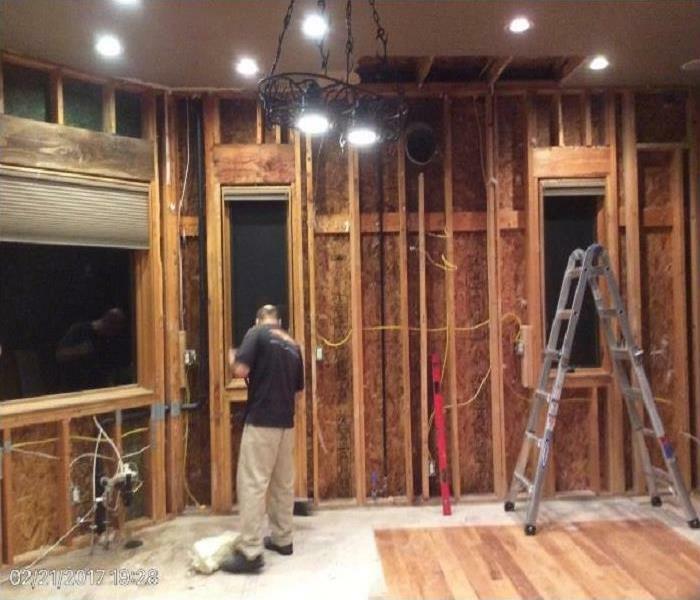 This inside view from a home in Bend, Oregon shows the extensive damage the snow storm did. We were happy to take on the job! 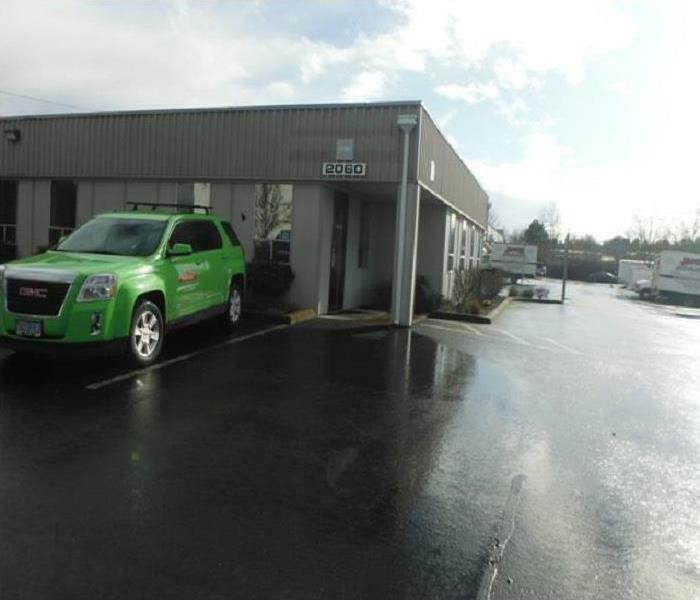 If you have water damage from a storm or burst water pipe give us a call at SERVPRO of Salem West for an estimate (503)393-9999. 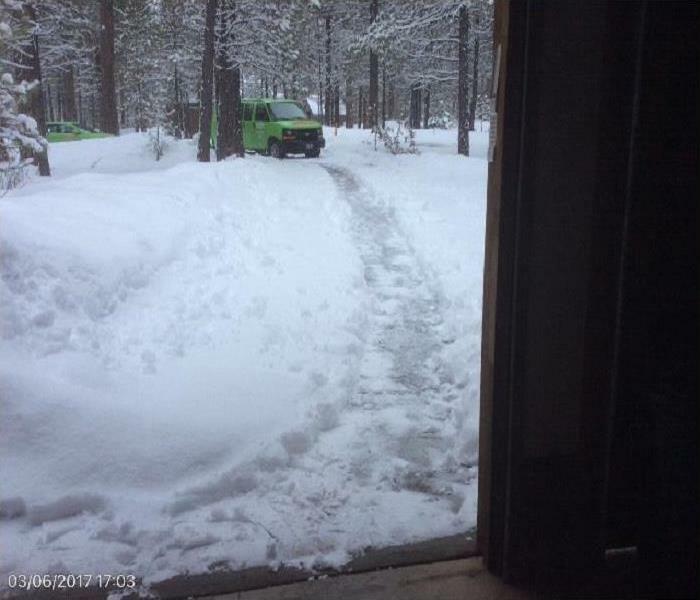 "Snow Is Fun Until It Causes Damages"
This is the snow storm from February 2017 in Bend, Oregon. 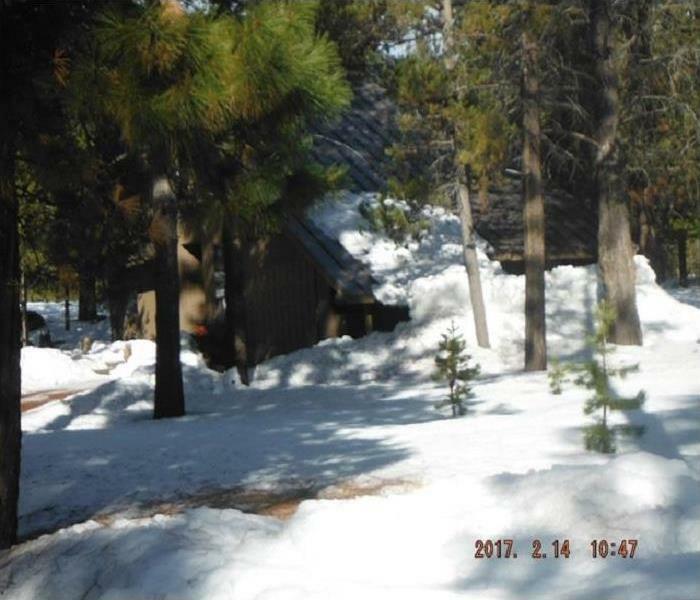 With all the melted snow and ice that covered this home, it left behind damages. Good news for you, our team at SERVPRO can handle anything a storm has to throw at us. Call SERVPRO of Salem West for an estimate (503) 393-9999. This is a home in Aumsville, Oregon that was hit by a tornado. SERVPRO was first to respond and get the job done right. If a storm of any kind hits your home or business, give SERVPRO of Salem West a call for an estimate. (503) 393-9999. "Ice Turns To Water, Water Turn To Damage"
Storms are very unexpected, so is finding out it has damaged your hard wood flooring. SERVPRO of Salem West is here 24/7 to take care of the unplanned and unexpected. Call SERVPRO of Salem West for an estimate at (503) 393-9999. 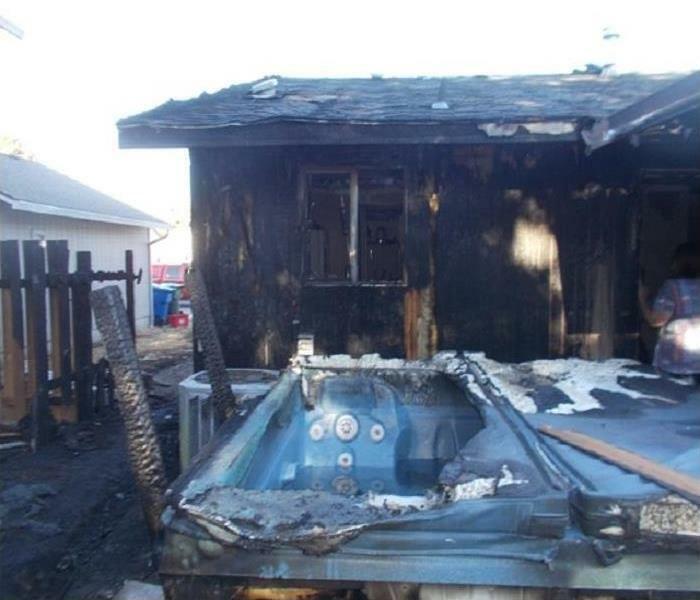 This Independence, Oregon home caught fire- a small fire that spread fast in very little time. SERVPRO employees take the time to help you pick out any salvageable items to take back to our facility. We then clean them removing any soot or smell. We get things back to normal "Like it never even happened." 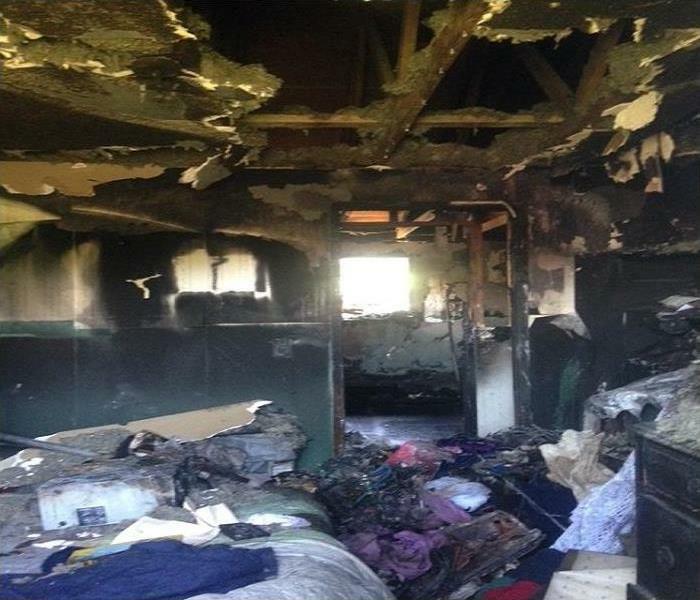 If fire strikes your home, call SERVPRO of Salem West at (503) 393-9999 for an estimate. 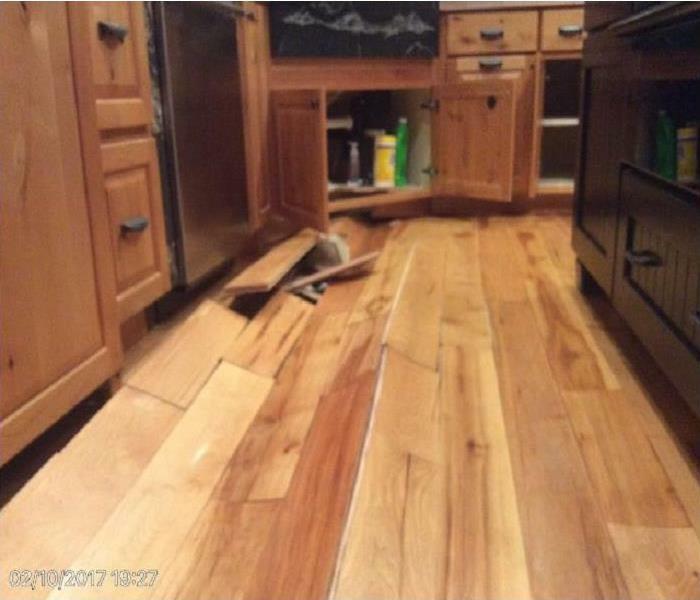 "Let SERVPRO Handle The Cleaning"
This is not the kind of clean up anyone wants after a nice thanksgiving dinner. Thankfully SERVPRO of Salem West has an amazing team of helpful, hard working employees to take care of an unfortunate fire like this one. Get an estimate for your Salem, Oregon home. 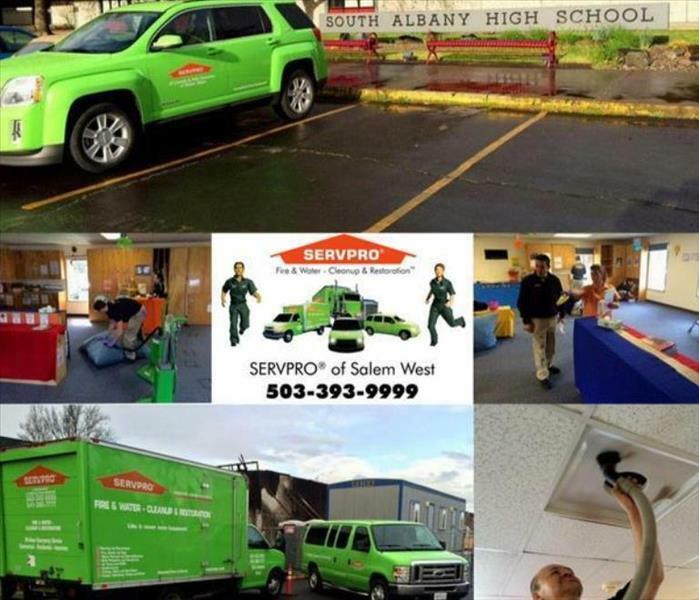 Contact SERVPRO of Salem West at (503) 393-9999. 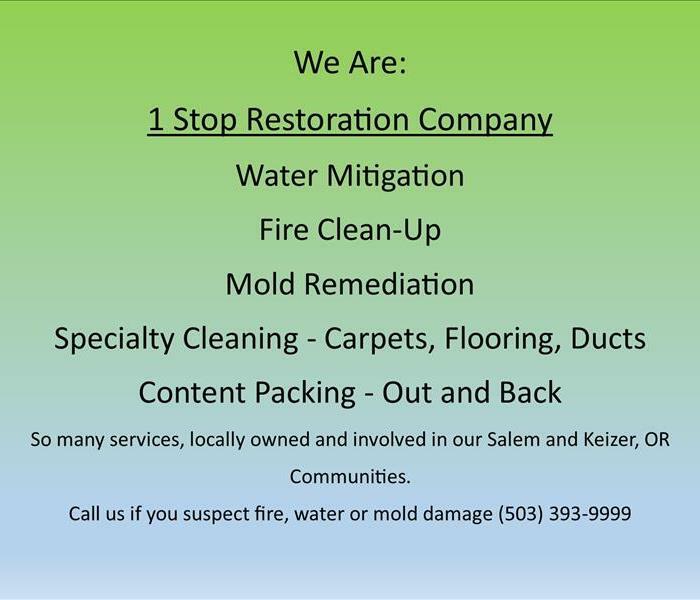 Salem, Oregon Keizer, Oregon water damage, fire damage, bio cleanup, mold remediation, commercial services. "Be Safe, Cautious and Prepared"
You can never be too safe when it comes to fire. 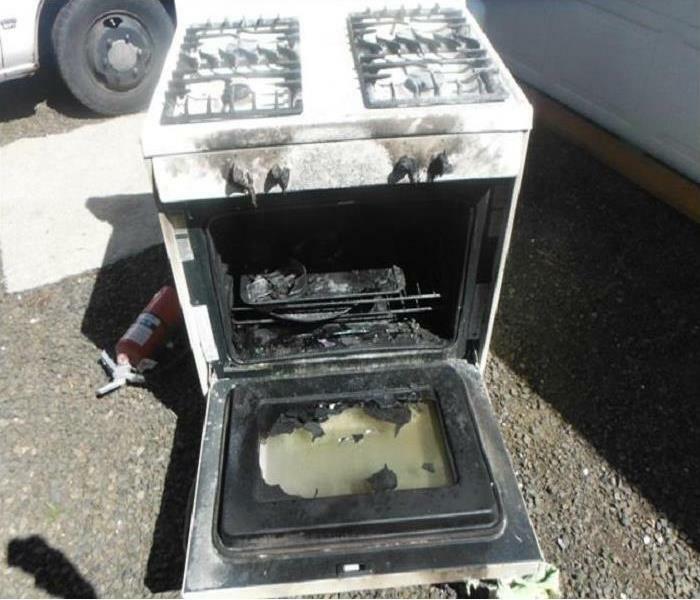 This Salem, Oregon fire was caused by faulty electronics. 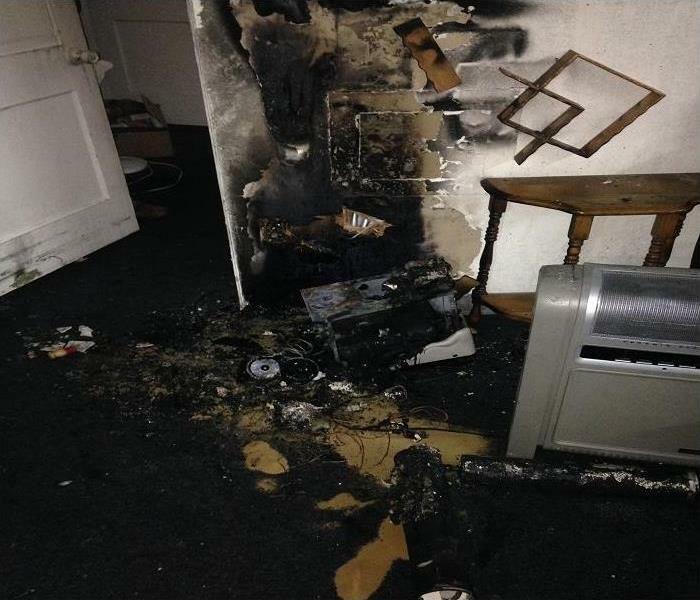 Be sure to check outlets, wiring and electronics frequently to avoid a fire like this. For an estimate, contact SERVPRO of Salem West at (503) 393-9999. 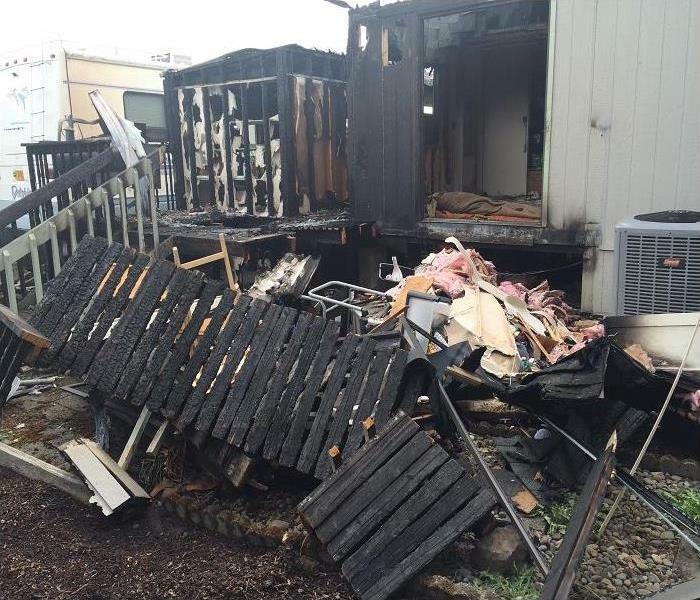 A fire took place at this Salem, Oregon manufactured home. Our team here at SERVPRO of Salem West got the job done. We make things look "Like it never even happened." For an estimate contact SERVPRO of Salem West at (503) 393-9999. "Fire Can Strike At Any time"
This was a fire that took place in the backyard of a Salem, Oregon home. SERVPRO of Salem West specializes in fire clean up and repairs. Let us be the ones to take the worry out of a situation like this. Call for an estimate at (503) 393-9999. Anything can happen even in a big facility. Let our polite, courteous and well-trained employees from SERVPRO of Salem West fix the issue in a timely manner. Call SERVPRO in Salem, Oregon for an estimate at (503) 393-9999. Continuing Education is better with BBQ! 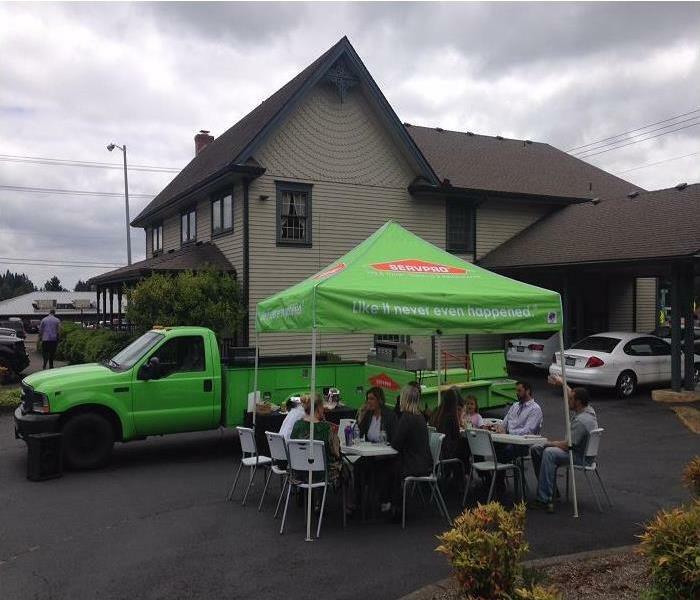 SERVPRO of Salem West makes continuing education enjoyable and sometimes we BBQ. After a three hour Ethics Class for Premier NW Insurance in Salem, Oregon, the agents were hungry. So we decided to bring our BBQ trailer, drinks and sound system. 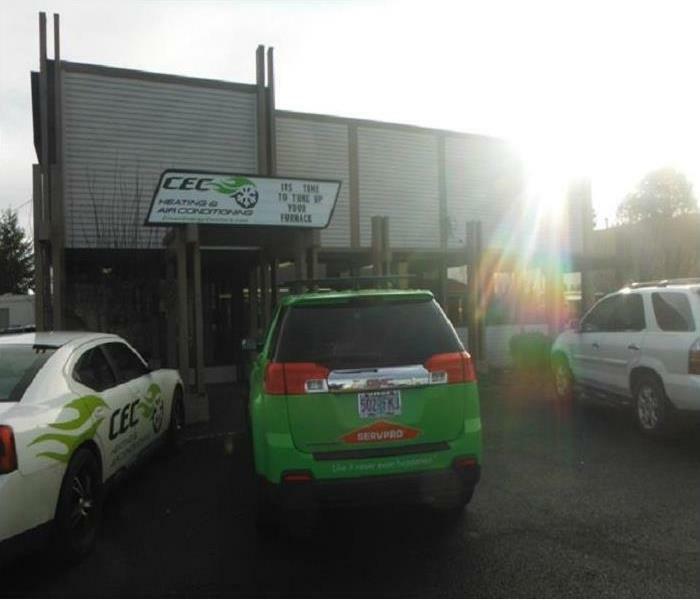 If you need CE credits, SERVPRO of Salem West has a number of classes available in Salem, Oregon. Call us at (503) 393-9999. 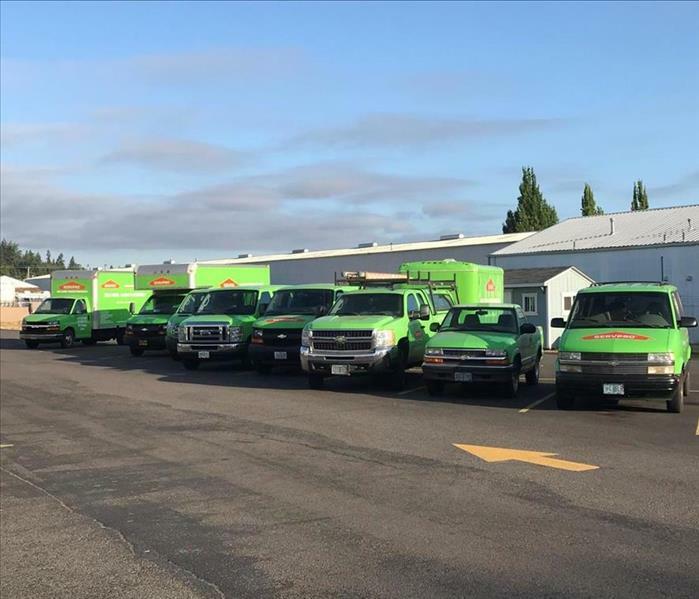 "We Work Fast To Keep Your Business Operating"
Regardless of accidental or storm damage, SERVPRO of Salem West has employees that work fast to keep business running or to get those doors back open for business. Call to schedule an estimate at (503) 393-9999. SERVPRO of Salem West can perform commercial floor cleaning too. Our technicians can strip, wax and seal your commercial flooring. No matter if its tile, VCT or hardwood, we have the expertise in Salem, Oregon to make your floors clean and protected. Call us for an estimate at (503) 393-9999. 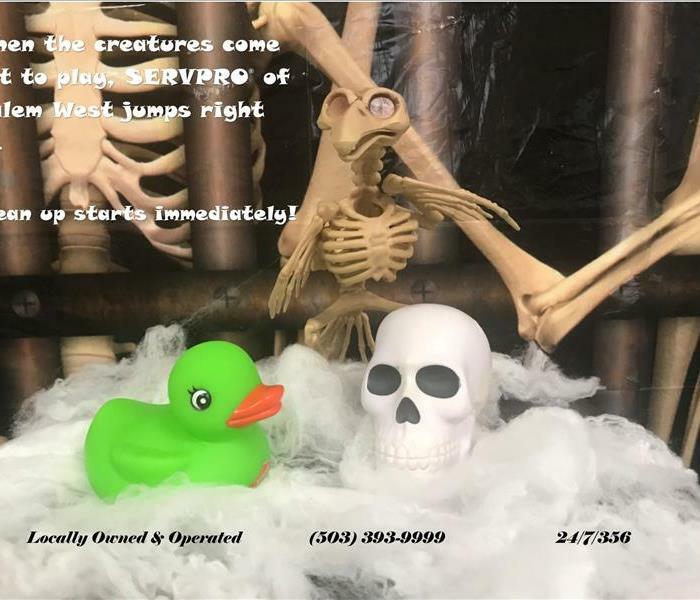 At SERVPRO of Salem West we take all precautions to keep our team members and our customers safe. If you suspect mold in your Waldport, Oregon home, let SERVPRO professionals take care of it for you. For an inspection and estimate contact us at (503) 393-9999. 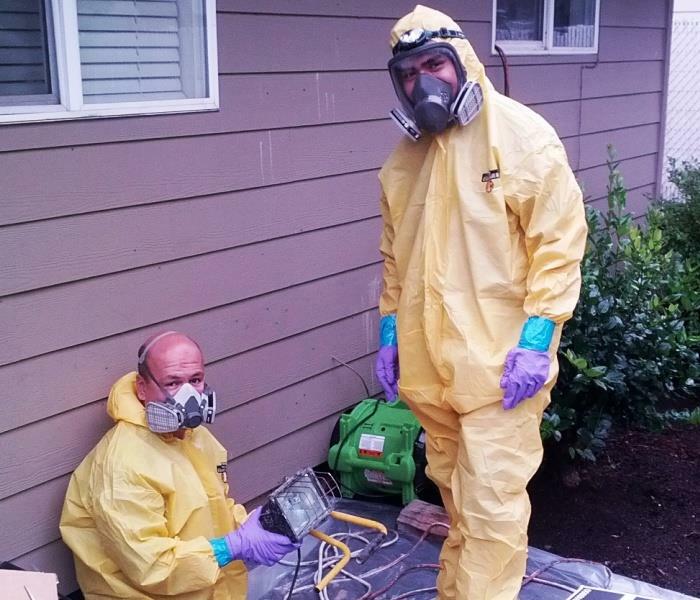 Trained Salem, Oregon mold remediation technicians keep you, your family and pets safe during the cleanup process. SERVPRO of Salem West maintains a group of fully trained and qualified mold remediation technicians. 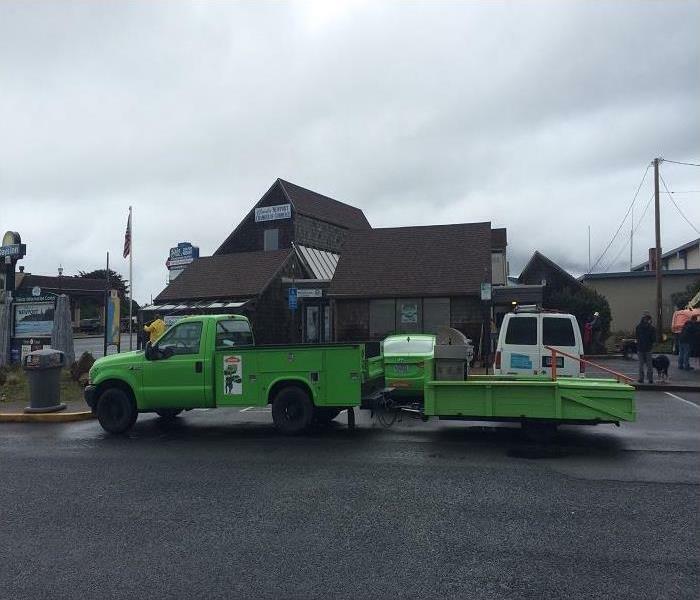 For an inspection and estimate in Lincoln City, Oregon contact SERVPRO of Salem West at (503) 393-9999. 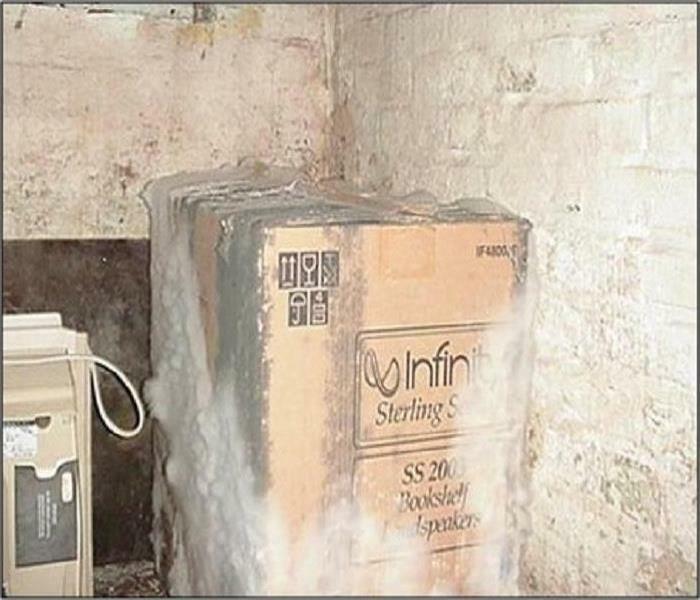 Boxes that sit in basements, garages, and attics collect moisture over time causing mold to grow. 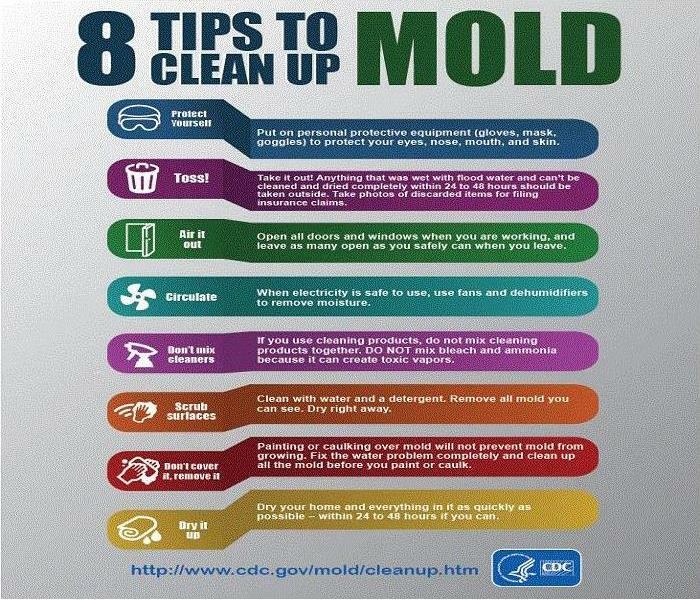 Make sure to move those boxes around to examine and prevent mold growth. For an inspection and estimate to remediate mold from your Salem, Oregon home, contact SERVPRO of Salem West at (503) 393-9999. If you have this issue in your Newport, Oregon home, contact SERVPRO of Salem West for an inspection and estimate for mold remediation services (503) 393-9999. You can obtain more information from the Center For Disease Control by clicking HERE. For an inspection and estimate to remediate mold from your Woodburn, Oregon home, contact SERVPRO of Salem West at (503) 393-9999. 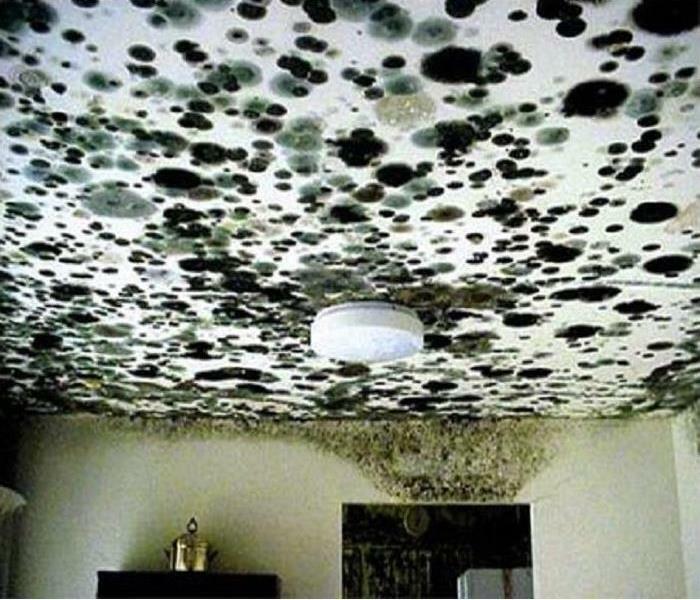 Mold can grow in places you wouldn't think of. 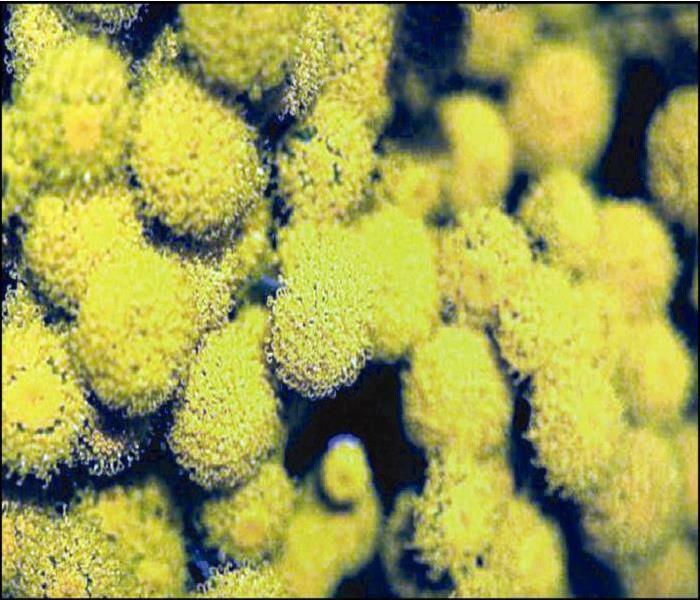 Mold can also spread fast. If you suspect mold in your home or business, call SERVPRO of Salem West at (503) 393-9999 for an estimate and inspection. What happens when you have an idea that benefits your business community and then you share that idea with others? The Newport Chamber Of Commerce office was in need for some exterior cleanup work. We were happy to organize the event and invite others to participate. 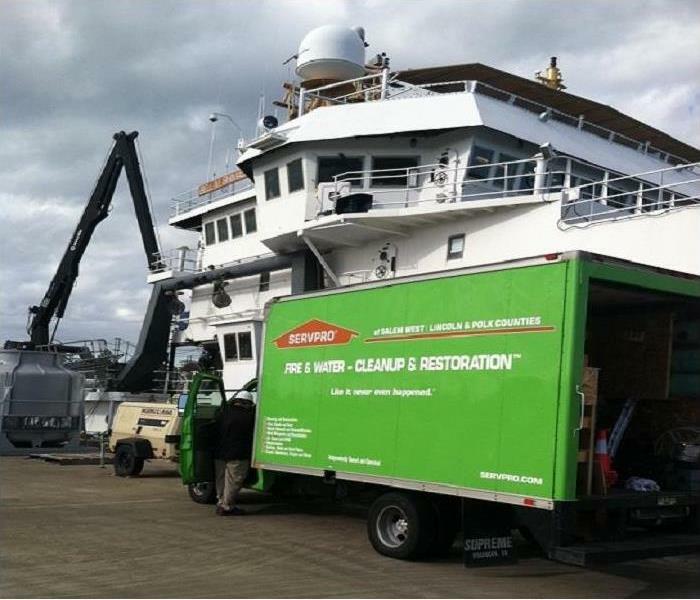 Dahl "Better Bark & More"
We can clean anywhere, anytime and anything, even a NOAA ship in Newport, Oregon. SERVPRO of Salem West has been providing cleaning services for NOAA for years and we are happy to do so. 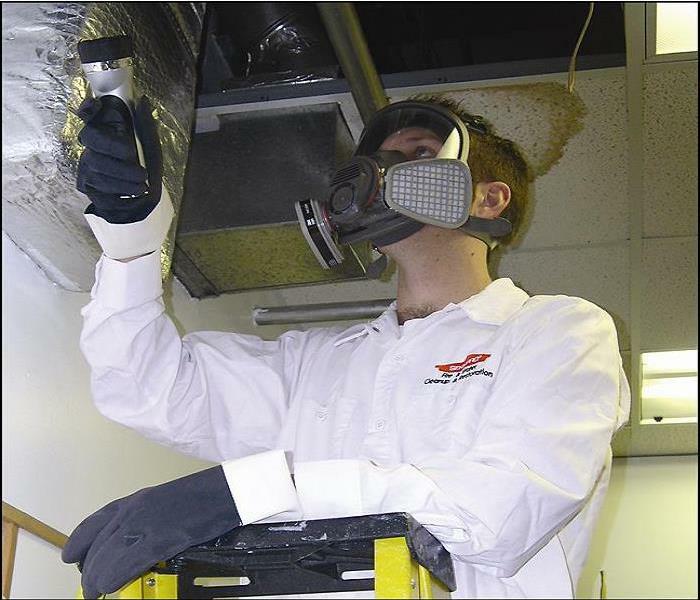 From internal HVAC duct cleaning to other services, we are thrilled to provide these services. The unique challenges, opportunities and enjoyment we get by helping to keep the inside of this fleet clean helps us know that our work is needed and appreciated. Thank you NOAA for your business and trust. This commercial building located in Woodburn, Oregon suffered a large water damage due to multiple issues. One of which is incorrect installation of building materials. Poor installation of building materials is a major cause of internal damages. Should you see something that doesn't look correct, bring it up to your contractor and ask lots of questions. Just by asking a few simple questions you could save your building from sustaining damages that could cost thousands to repair. Locker rooms need cleaning too, especially when your teams plays up to 38 home games. That's a lot of activity along with field dirt that gets tracked into the player locker rooms. It's great to see behind the scenes at one of our favorite home town sporting events. For more than 20 years, Volcanoes Baseball has provided great entertainment in the Salem - Keizer, Oregon region. South Albany HS located in Albany Oregon experienced a fire the destroyed the cafeteria, band room and home economics room. We were called into clean the CDC building. We cleaned it so it looked "Like it never even happened." Update as of 08/15/2016. The South Albany HS Cafeteria is now ready for the 2016-2017 school year with a modern facility that allows for eating space and classrooms. This is a top notch facility and the Greater Albany Public Schools has a model building. Thanks to the School Board and also the Special Districts of Oregon (SDAO) for working through his process. SERVPRO of Salem West is a great supporter of the local professional baseball team. The Volcanoes Baseball team is a development team for the San Francisco Giants. Some great players have played on this field. Come out and enjoy a game with use. The view from #SkyBox9 is fantastic. This venue provides a great family, friendly atmosphere. If you want to be a guest of ours just call the marketing team at (503) 393-9999. 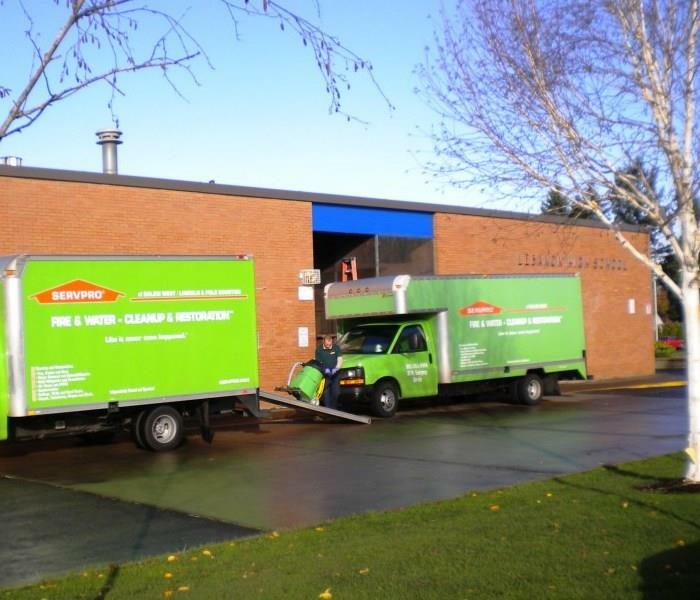 Lebanon High School in Lebanon Oregon suffered a loss and called SERVPRO of Salem West to come in and clean up the mess. Job handled and kids back to school! 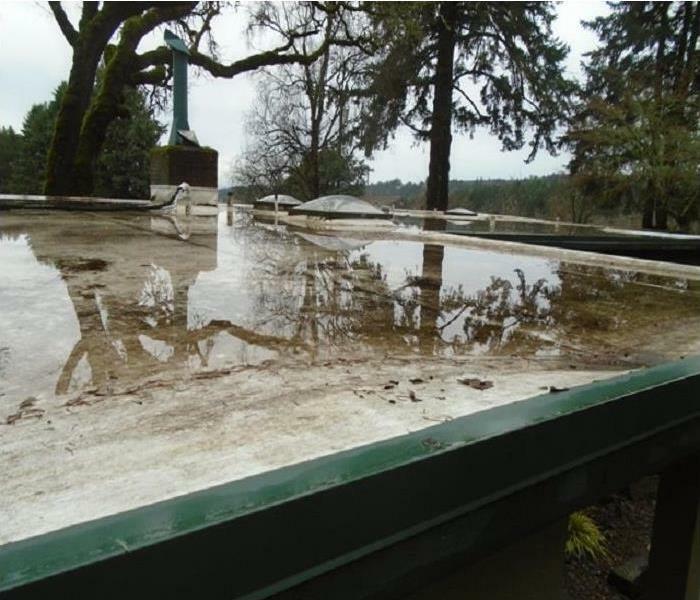 When the First Church of the Nazarene located in Salem, Oregon experienced a water loss they called in the team of SERVPRO of Salem West to inspect, scope and dry the facility out. When the community of Aumsville was hit by a tornado, SERVPRO of Salem West was called in by the locals to begin the process of cleanup and restoration. This event affected the whole community who rallied around each other to put their lives back together. When it's a dirty job, you need to get suited up and work your way into the crawl space. Our technicians will go where others won't so you can have a clean home. Thanks team! 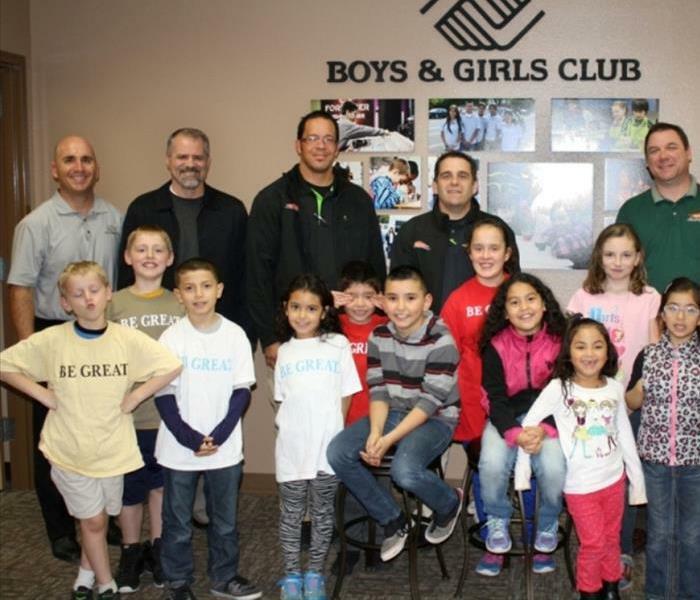 The Boys & Girls Club of Salem, Oregon was the beneficiary of the 6th Annual SERVPRO of Salem West Charity Golf Event. This was a community event where partners and golfers come together for golf, food and for the kids of our communities. We can do great things when we work together. 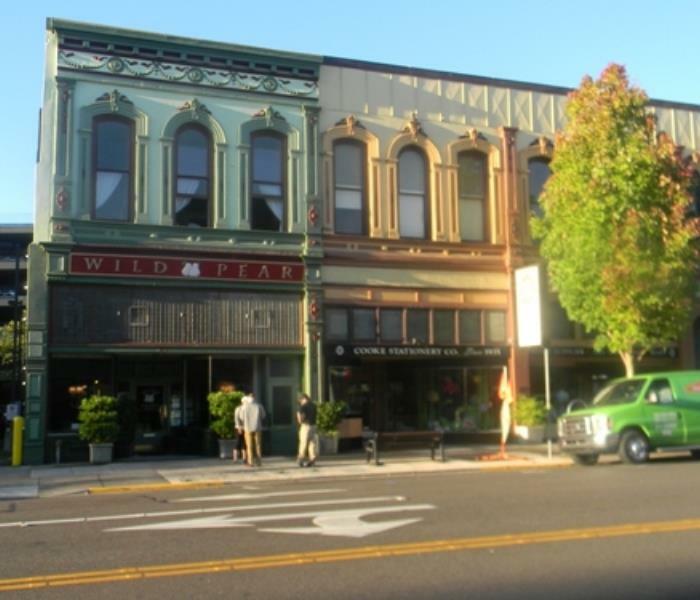 When the Wild Pear Restaurant in Salem, Oregon experienced water damage, SERVPRO of Salem West was called in to inspect and put together a plan to assist the general contractor. They worked together so the restaurant could resume business. The restaurant is located inside historic building in downtown Salem. We worked with the building owner and Salem Historical Society because additional planning and guidelines had to be followed. The general contractor, the historic society and our team worked together to ensure any building materials that could be salvaged, such as the tin ceiling tiles, would be kept intact and in place. Thank you to Rich Duncan Construction and the Salem Historical Society for your input and entrusting SERVPRO of Salem West to perform the dry-out services. 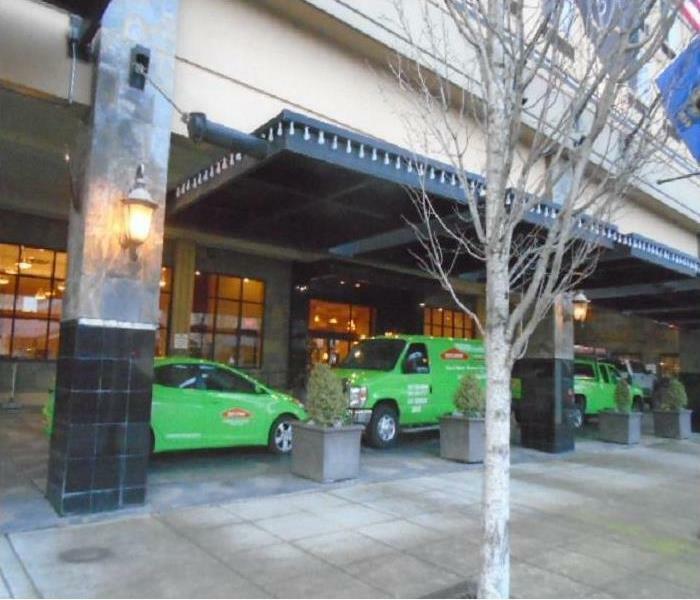 When the Grant Hotel had a water loss, they called SERVPRO of Salem West to clean it up and dry it out. "Very fast, very organized" is how they described our response!